Why did you paint this massive piece? 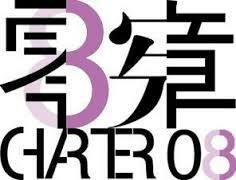 I was attracted to the story of Liu Xiabo and the creation of Charter 08. 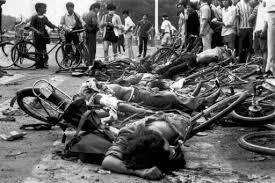 This goes back to the terrible tradegy of 1989 and how the Communist Chinese government decided to literally run over the unarmed civilian protesters with tanks rather than reform. 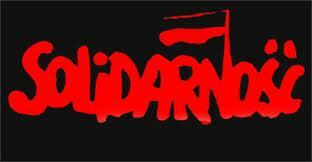 At the same time I had seen the peaceful transition of Poland from communism in 1989. Why was Charter 08 written? In the events of the 2008 Earthquakes and the scandals of collapsed children’s schools, people started to investigate the scandals of corrupt politicians and builders colluding for profit at the expanse of children’s death. 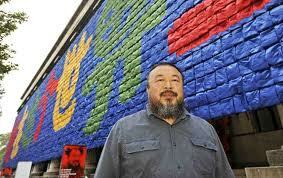 Ai Weiwei was one of the principal independent investigators into this tragedy. He created a massive display of backpacks construed into a mural. The backpacks represented the 5000 children that perished in the earthquakes and shoddy schools. The mandarin in the work talks about the feelings of the mother of a victim. How did the government react to Ai Weiwei’s investigation and show? 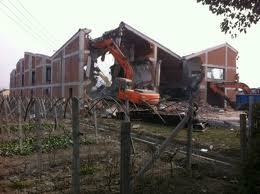 Well, typical of the single-minded task of the CCP, they bull-dozed his $1 million studio in Beijing. They claimed he didn’t have a permit to the building code. Its ironic that the CCP chose to actively destroy his studio while covering up their complicity in shoddy building destruction leading up to children’s deaths by mother nature. How did other intellectuals respond to the Earthquake disaster? Several writers gathered and produced the document called Charter 08. This document was based on similar historical documents like the Bill of Rights and Charter 77. 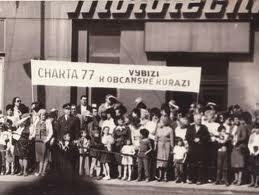 Charter 77 was written by reformists in Communist Czechoslovakia that led eventually to the regime’s collapse in 1989. The Bill of Rights in the US was to balance the powers of the state, federal power and the individual. Each of these 19 main points of the document are in the painting. There are a total of 76 characters, which symbolically refers to the US liberation of 1776 as well. How did the Communist party respond? They immediately rounded up Liu Xiabo and several signers. Liu Xiabo was eventually sent to prison for “inciting subversion of state power” for 11 years. So fearful are the authorities of these 19 points of written reform. How did the world respond? Liu Xiabo was awarded the Nobel Peace Prize in 2010. All representatives of Liu were blocked from attending and accepting the award on his behalf. 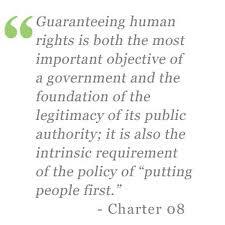 Over 10,000 people have signed online the Charter 08 since the original 303 signed. 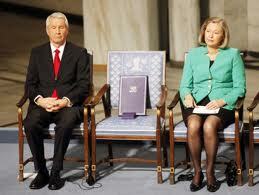 Have other winners been blocked by their governments from accepting the Nobel Peace Prize? 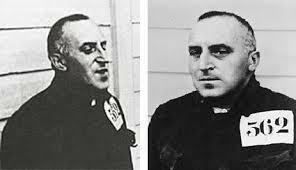 Yes in 1935 Hitler kept Carl von Ossietzky in prison. In 1991, Aung San Suu Kyi was kept away by Burmese military government. This gives you an idea of the type of government Chinese people live under. How long did it take to paint this work? Yes, it took up to 6 weeks. My wife almost had a heart attack saying, “it’s blocking all the light!” continually. I started with the red layer representing the strong red of traditional Chinese painting and pot paintings. Then I painted a gigantic 303 in gold. Then I painted the whole thing in black and eventually formed abstract shaped over the painting. My next stage was to cut out each of the red characters. My final stage was to paint most of the 303 signatures, over 900 characters, around the entire frame of the painting. Are there other symbols in the painting? Yes, the characters line up into 8 rows and 10 columns. In China, the year 08 for the Olympics came to represent the pinacle of luck as known in chinese numerology. The tragedy of the 08 Earthquakes wiped out the good PR from the Olympics to expose the political corruption under the surface. This painting hopes to capture the meaning of Charter 08 and the hope of Chinese people to reform their government into a modern democracy with respect for human and individual rights.